The authors examine some of the most significant ongoing transnational or "spillover" problems associated with the continuing conflict in Iraq, with particular attention being paid to those problems that could disrupt or even undermine the stability of regional states beyond Iraq. Spillover issues addressed include refugees and displaced persons fleeing Iraq in large numbers for neighbouring countries, cross-border terrorism, intensification of separatism and sectarian discord among Iraq's neighbours fuelled by conflict in Iraq, and transnational crime. 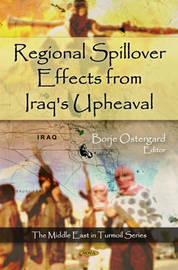 This work assumes that spillover influencing neighbouring states will continue to occur even in the best case scenarios where the Iraqi government rapidly assumes full sovereignty over the entire country in ways that allow it to provide security and stability to most of the population. In perhaps the more likely event that Iraq continues to wrestle with serious internal conflict, cross-border spillover problems could be significantly more intense. This book is designed to serve as an overview of the present dangers for Iraq's neighbours, which may intensify as a result of the ongoing conflict within Iraq.